Staff seated are : Helen Sargent, Howard Shevrin, Leonard Horwitz, Julia Fraknoi, Richard Sigal, Stephen Appelbaum, Irwin Rosen. 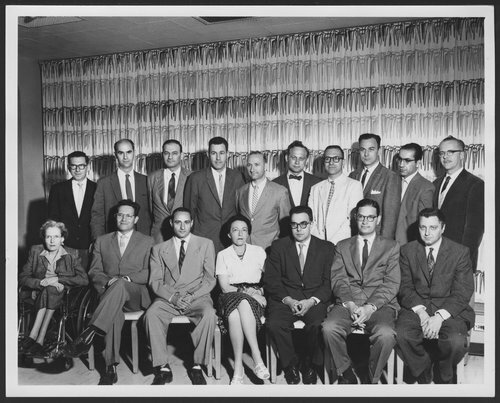 Standing are : Martin Mayman, Herbert Schlesinger, Lester Luborsky, Gerald Ehrenreiz, Philip Holzman, Howard Perlmutter, Ernest Hirsch, Harold Mandl, Bady Quintar, and Verlyn Norris. The photograph was taken in the hospital dining room. Menninger is a leading psychiatric hospital dedicated to treating individuals with mood, personality, anxiety and addictive disorders, teaching mental health professionals and advancing mental healthcare through research. It was located in Topeka, Kansas, from 1925 to 2003 and is now in Houston, Texas. Staff seated are : Helen Sargent, Howard Shevrin, Leonard Horwitz, Julia Fraknoi, Richard Sigal, Stephen Appelbaum, Irwin Rosen. Standing are : Martin Mayman, Herbert Schlesinger, Lester Luborsky, Gerald Ehrenreiz, Philip Holzman, Howard Perlmutter, Ernest Hirsch, Harold Mandl, Bady Quintar, and Verlyn Norris. The photograph was taken in the hospital dining room. Menninger is a leading psychiatric hospital dedicated to treating individuals with mood, personality, anxiety and addictive disorders, teaching mental health professionals and advancing mental healthcare through research. It was located in Topeka, Kansas, from 1925 to 2003 and is now in Houston, Texas.